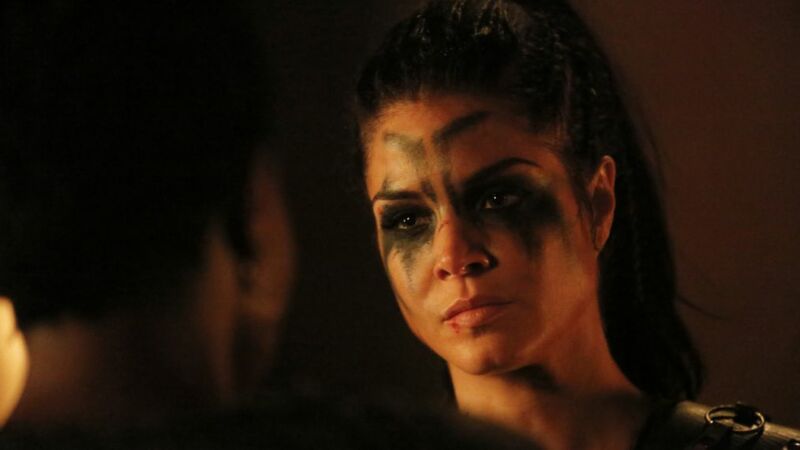 Ever since Marie Avgeropoulos' "girl under the floor" emerged from the dropship in The 100's series premiere, the dynamic between her Octavia and big brother Bellamy (Bob Morley) has been, at best, fraught. He was an overprotective jerk, she never connected with the Sky Crew and then fell in love with a Grounder, he went and killed like 300 Grounders, she became Indra's second...but all along, these two clearly cared intensely for one another. Hence the multiple times they have saved each other's hides. Octavia did right by Ilian, but can she live with her choice? And now, as the death wave of nuclear horror heads towards the last surviving humans on Earth in Wednesday's Season 4 finale, "Praimfaya," brother and sister have put that all behind them and share a convo fans of the siblings have been waiting for since, well, probably the last nuclear holocaust. In this exclusive clip from the finale's opening scene, Bellamy lifts up his sister as she prepares to take leadership of the group seeking shelter in the bunker, while she opens her heart to him about her fears and, more importantly, her feelings about the guy who helped raise her. If the world has to end, at least we get this gorgeous scene before the signal goes dead. And having seen the entire hour, we can confirm/warn you that things only get more emotional, intense and, for a few of the gang, lethal from here. So buckle up.